Accidents happen all the time in the haulage industry and unfortunately over the years W & J Riding suffered their fair share. 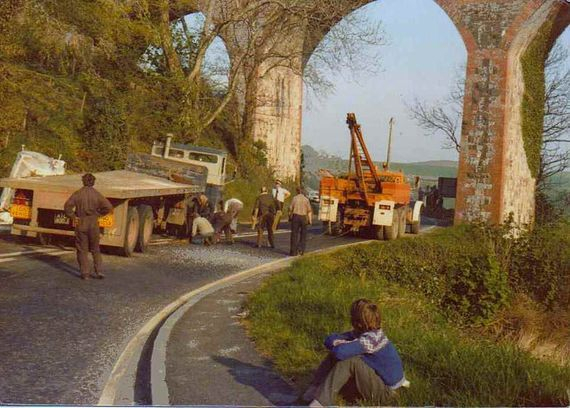 Below is another selection of various incidents which Tom Riding documented from the mid 1950's through to when he retired from the company in 1995. 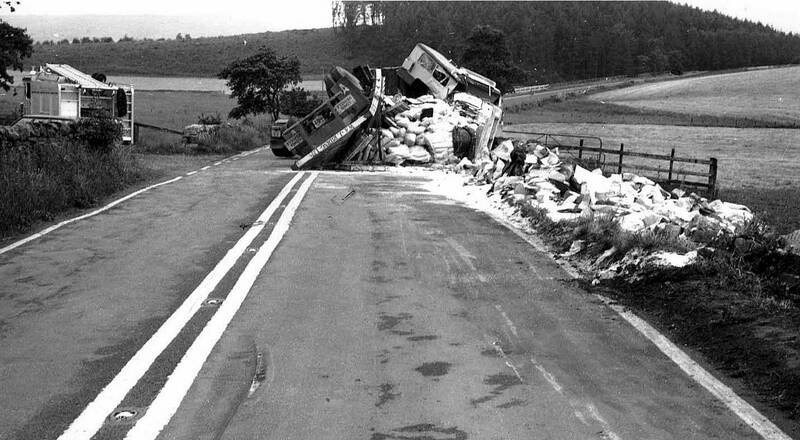 Early in 1970 Atkinson Mk II 4x2 tractor unit Reg No UTB 370H Fleet No 32 'Illustrious' was travelling on the A75 near Eastriggs in Scotland hauling a Crane Fruehauf four in line trailer carrying 16 tons of plastic pellets in tote bins to Stranraer on Riding's Wilton -Kilroot service when it was involved in a terrible accident through no fault of it's driver Jack Moon. A van carrying two young work men going home from work pulled out of a line of on coming traffic and ran head on into UTB 370H which caused it to crash into a large solid oak tree at the side of the road. The van was complete wrecked and sadly the two men in the van were killed. The cab of the Atkinson was completely destroyed by the impact but miraculously driver Jack Moon came out of the carnage with just a broken hip joint which unfortunately still causes him some discomfort to this day. 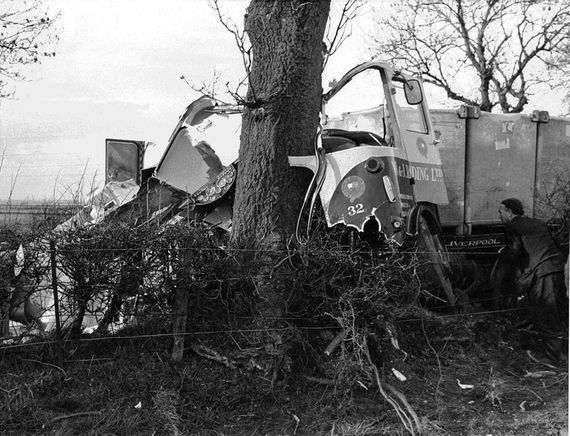 After the head on collision with the van UTB 370H collided with this large oak tree at the side of the road resulting in the cab being completely destroyed. 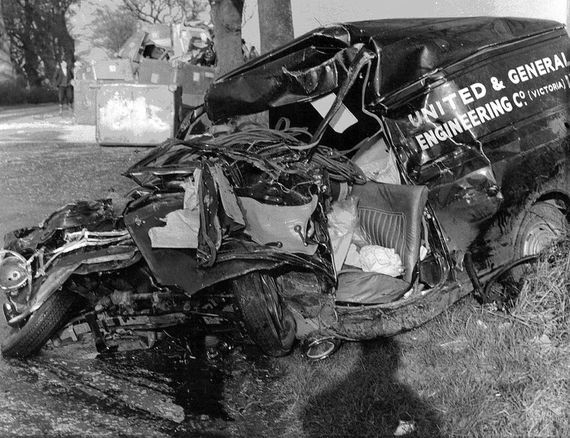 The utter devastation caused to the van after it hit the Atkinson head on at Eastriggs in Scotland. Unfortunately the two occupants were killed in the collision. Police officers help to clear the road and get one lane of the busy A75 open to traffic again. 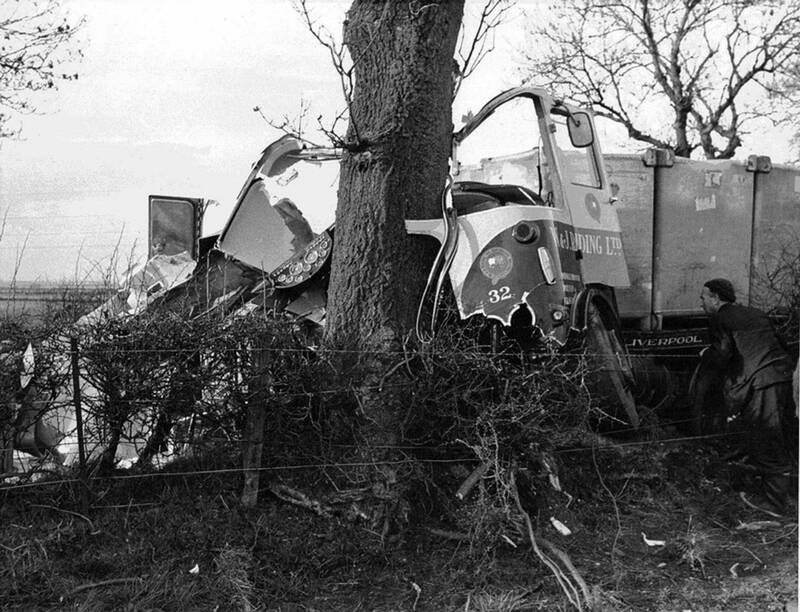 With one lane of the A75 reopened to traffic the remains of Atkinson Mk II 4x2 tractor unit Reg No UTB 370H are seen embedded in the tree at the side of the road awaiting recovery. W & J Riding mechanics Tony Stephenson, left, and Tim Hurstwaite, right, survey the wreckage of Atkinson Mk II 4x2 tractor unit Reg No UTB 370H at Longridge after it was recovered from the scene of the accident in Scotland. The tangled remains of Atkinson Mk II 4x2 tractor unit Reg No UTB 370H are seen here on the back of a trailer after being recovered from the scene of the accident. Unfortunately the impact with the tree knocked off the compressor which smashed the front of the crankcase. Fortunately Tom Riding sourced an old Gardner 150 crankcase with the thick steel backed main bearings. Pelican Engineering of Leeds line bored the case and fitted a new set of thin wall shells. Following that the reliable Gardner engine ran faultlessly for the rest of its life. 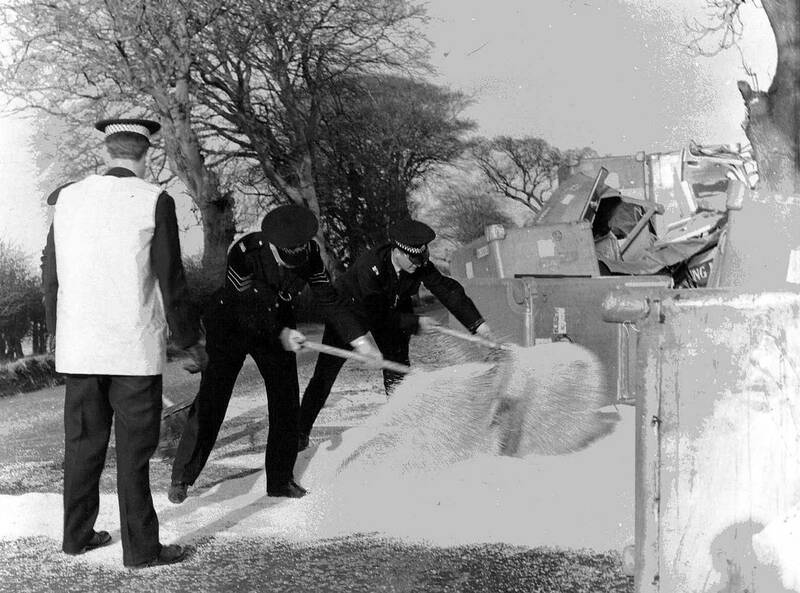 On the 30th of October 1970 Atkinson Mk I Silver Knight 4X2 tractor unit Reg No NTB 600G, which was used on the Teesside trunk, was heading home on the A171 at Ormesby Bank in the early hours loaded with drums of chemicals. A car travelling in the opposite direction hit the drivers side of the Atkinson resulting in extensive damage to the offside of the cab and steering mechanism. Unfortunately the driver of the car was killed in the accident. 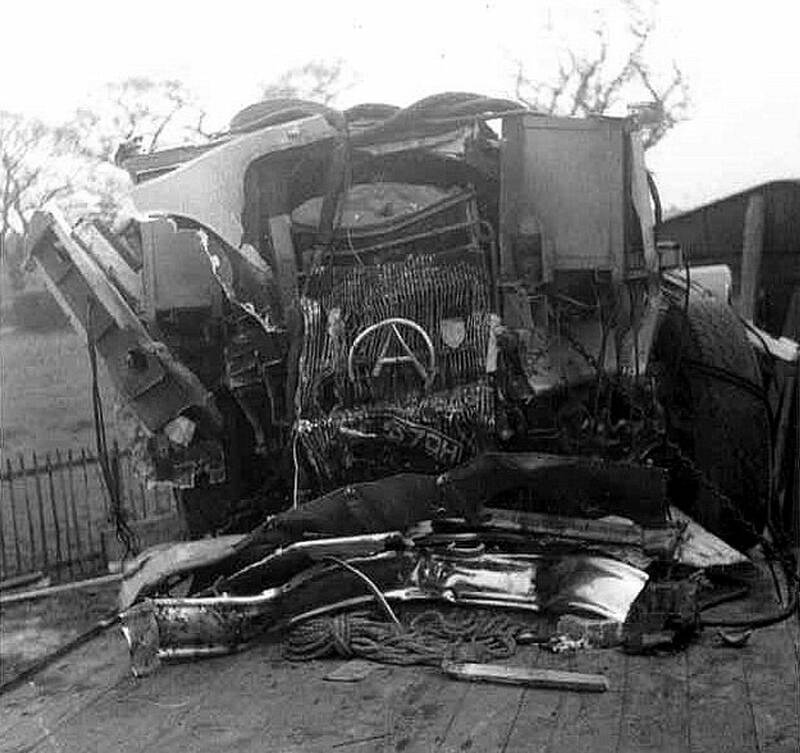 The damage sustained to the front offside of Atkinson Mk I Silver Knight 4X2 tractor unit Reg No NTB 600G after it was hit by a car travelling in the opposite direction. As a result of the following investigation it was found that Riding's driver was in no way to blame for the accident in which the unfortunate car driver was killed. 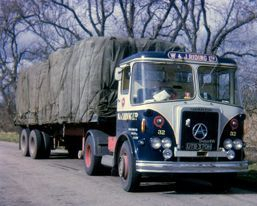 Atkinson Mk I Silver Knight 4X2 tractor unit Reg No NTB 600G was powered by Gardner 180 6LXB engine and was registered new on the 11th of September 1968 at a cost of £3,787 plus vat. 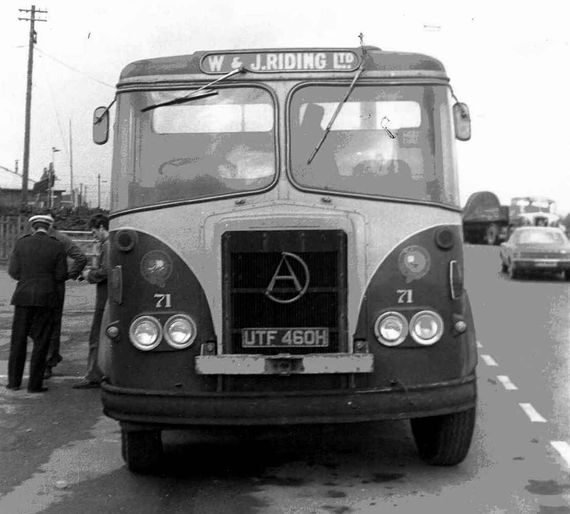 After being repaired in the workshops at Longridge NTB 600G went on to serve Riding's for another eight years until it was eventually sold on to T R Taylor of Melling near Liverpool for £1,600 plus vat on the 4th of October 1976. The badly damaged car which hit the front offside of W & J Riding's Atkinson tractor unit. Unfortunately, as a result of the accident, the driver of the car was killed. 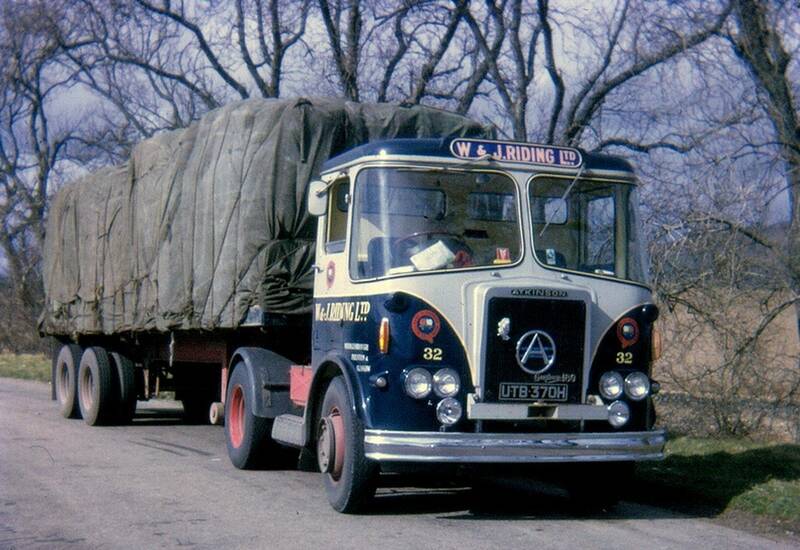 Atkinson Mk II 4x2 tractor unit Reg No RTJ 570G Fleet No 67 'Ulster Piper' was driven from new by the late Kenneth Wilson. On Wednesday the 27th of September 1972 Kenneth was driving back home to Longridge having changed his trailer at Stranraer. For some unexplained reason he lost control of his vehicle at Kirkcowan and crashed through a stone wall at a bend in the road with no other vehicle involved. Kenneth was very familiar with the A75 doing the Longridge-Teesside-Stranraer-Longridge round trip three times every week. The accident was a complete mystery and unfortunately Kenneth succumbed to injuries he received in the accident and died in Dumfries Hospital a few days later. 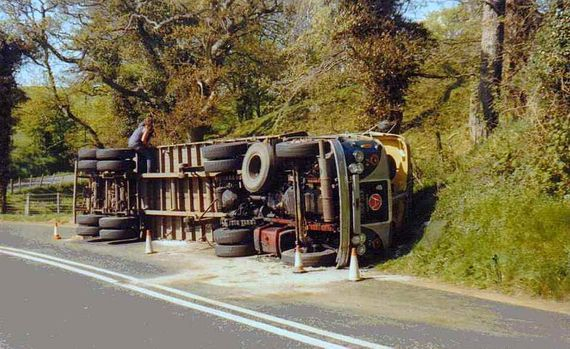 This was the scene after the accident at Kirkcowan on the A75 Stranraer Road with the trailer completely turned over and its load spilled in to the adjacent field. Another picture showing the devastation at Kirkcowan on the A75 Stranraer Road in Scotland. 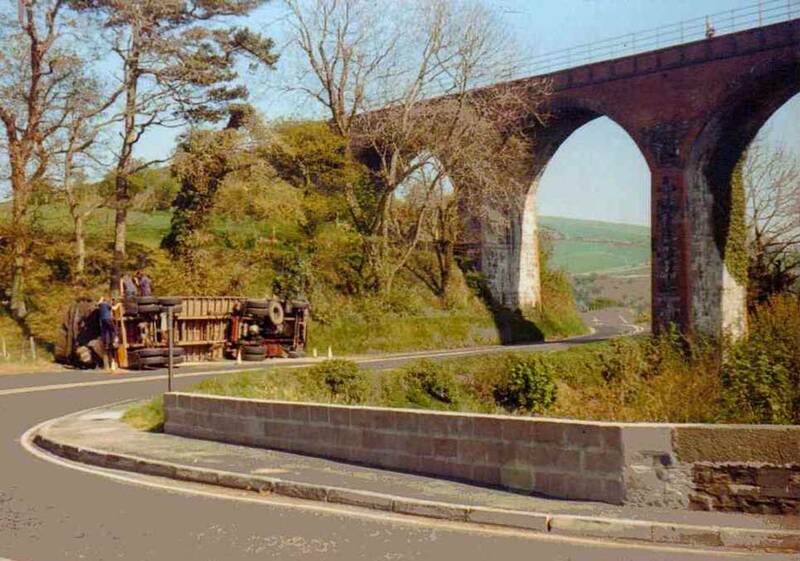 The badly damaged tractor unit can be seen along with the trailer which completely turned over in the accident. 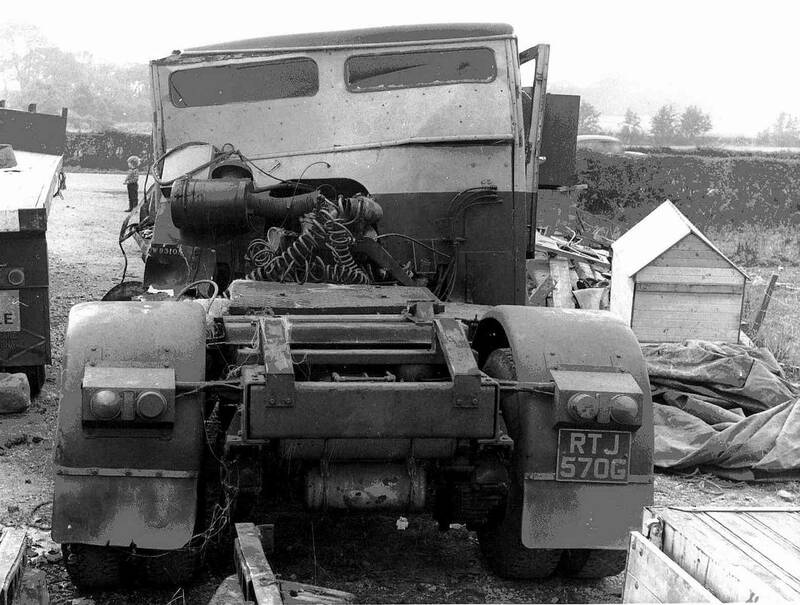 A rear end shot showing the twisted cab of the Mk II Atkinson. 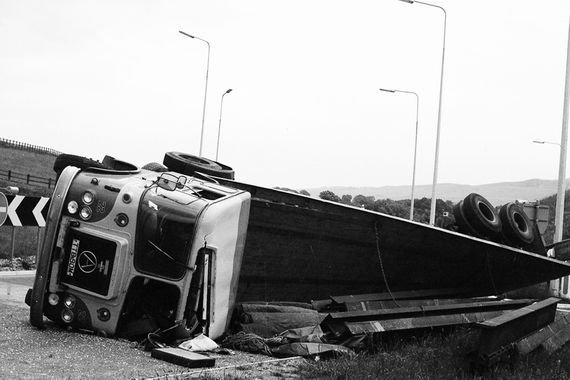 The absence of the fifth wheel, which was completely sheered off its mountings during the accident, gives some indication to the force of the impact. 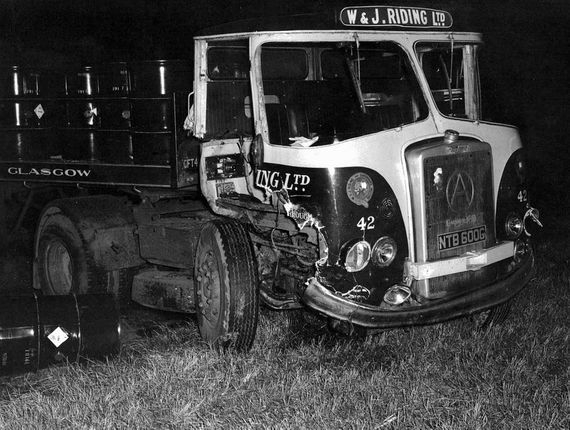 A close up shot showing severely damaged Mk II Atkinson 4x2 tractor unit Reg No RTJ 570G. 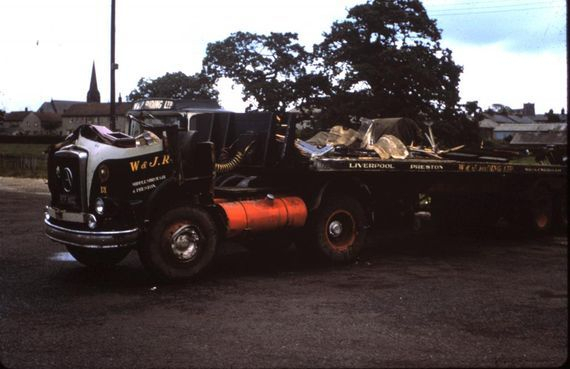 Powered by a Gardner 180 engine, in line with a David Brown gear box, RTJ 570G had been registered new on the 1st of June 1969 at a cost of £4,064. Tom Riding decided it would be best to re-register the vehicle as PTE 630L to disassociate it from its past history. On leaving Preston early one morning to go up empty to Teesside the driver lost control going down Halfpenny Brow which resulted in the cab being severely damaged. Atkinson Mk I Silver Knight 4x2 tractor unit Reg No RTF 810C Fleet No 13 was powered by a Gardner 150 engine in line with a David Brown 10 speed splitter gearbox. Registered new to Riding's on the 19th of October 1965 at a cost of £3,406 16s 9d it was assigned unlucky Fleet No 13. 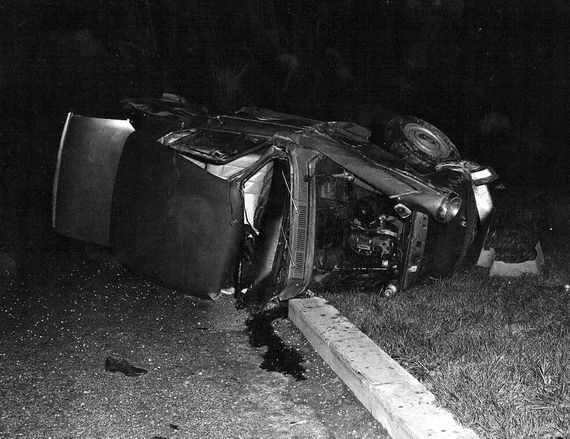 It was driven from new by the late Donald Thornton, however, on the morning of the accident the driver was Les Wilson. On leaving Preston early morning to go up empty to Teesside Les lost control going down Halfpenny Brow which resulted in the cab being severely damaged. After the impact Les finished up sitting in the road with the wrecked Atkinson all around him. Pictured above in the depot after being recovered the vehicle was totally rebuilt at Longridge and due to suspicious minds it's fleet number was changed to No 70. Seen here in the depot at Longridge after being recovered after the accident is another shot of Atkinson Mk I Silver Knight 4x2 tractor unit Reg No RTF 810C Fleet No 13. 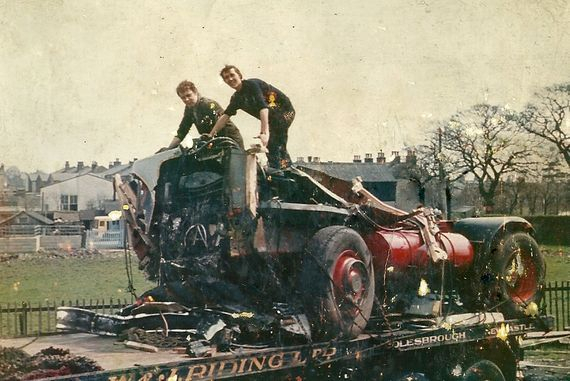 After being totally rebuilt by Riding's at Longridge it remained in the fleet for a total of eight years until 1973 after which time it was sold on to R. Atkinson & Sons of Preston for an unknown amount. Photographs courtesy of Jack Draper. 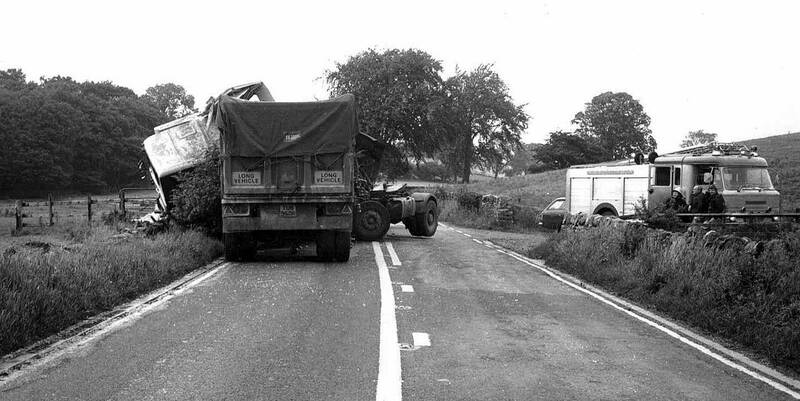 On the 29th of June 1978 Atkinson Borderer 4x2 tractor unit Reg No YWG 496K Fleet No 52 'Valiant' hauling a fully loaded tandem axle trailer was heading for home on the A59 just West of West Marten in North Yorkshire when it's driver of lost control on a left hand bend. 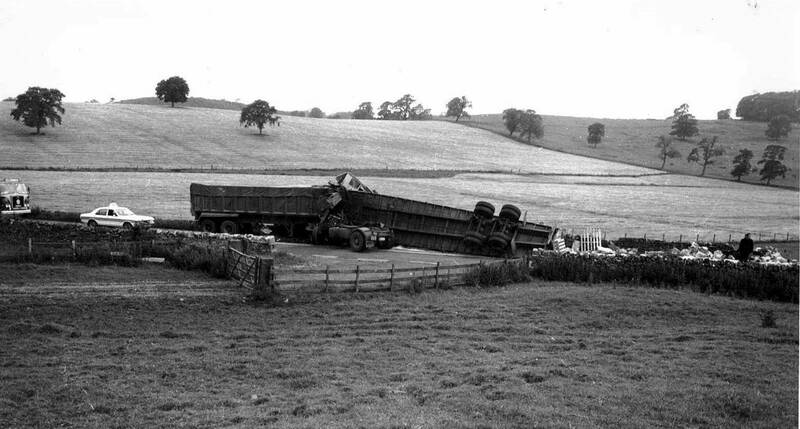 This resulted in the whole rig turning on its side and sliding down the road until it came into contact with a Seddon Atkinson unit and tipping trailer, belonging to Cowgills Transport of Skipton, heading in the opposite direction. Riding's driver was injured in the accident badly damaging his leg and he never drove heavies again. Taken from a distance this picture shows the aftermath of the head on crash on A59 at West Marten. The Atkinson Borderer is embedded into the front of the tractor unit and tipper trailer that was heading in the opposite direction. Click on any image to view them full size. 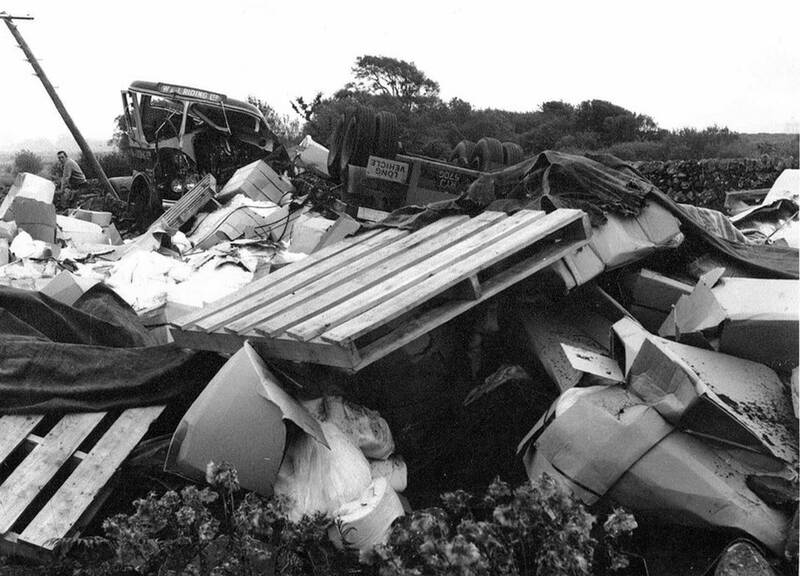 This was the scene of devastation after the two vehicles collided head on while travelling along the A59 with Riding's trailer finishing upside. The driver of Riding's Atkinson was very lucky to escape with his life after accident which left his vehicle embedded in the front of Cowgills tractor unit and tipper trailer. 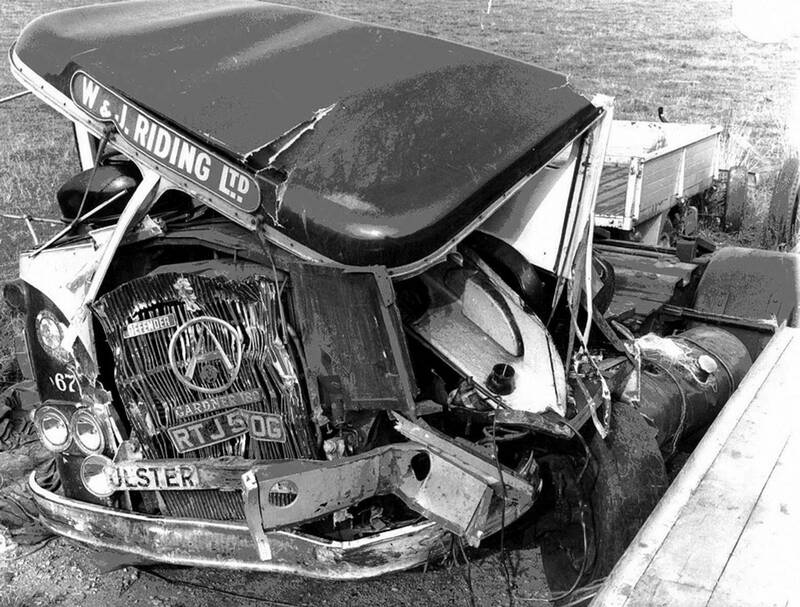 Atkinson Borderer Reg No YWG 496K Fleet No 52 'Valiant', involved in the accident, was originally new on the 1st March 1972 to TDG Group 'Monkland Motors' of Airdrie, at a cost of £5,366. 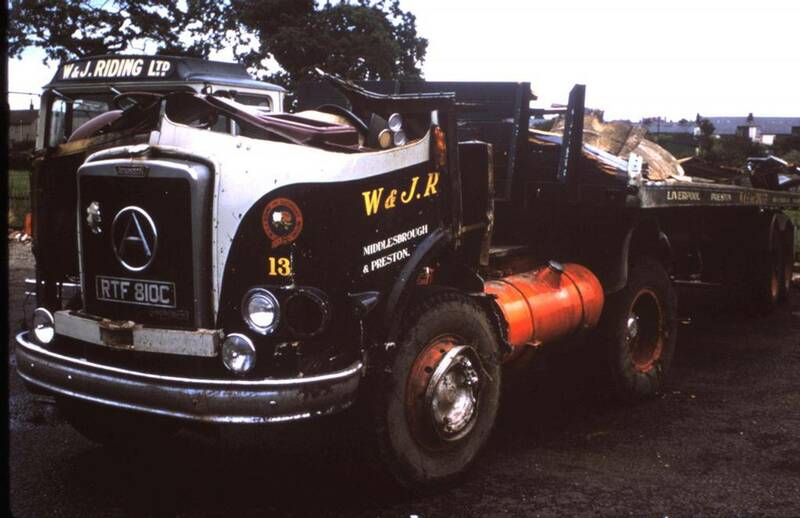 Tom Riding had purchased it from them in March 1975 for £2,781 along with nine other Atkinson Borderer tractor unit's. 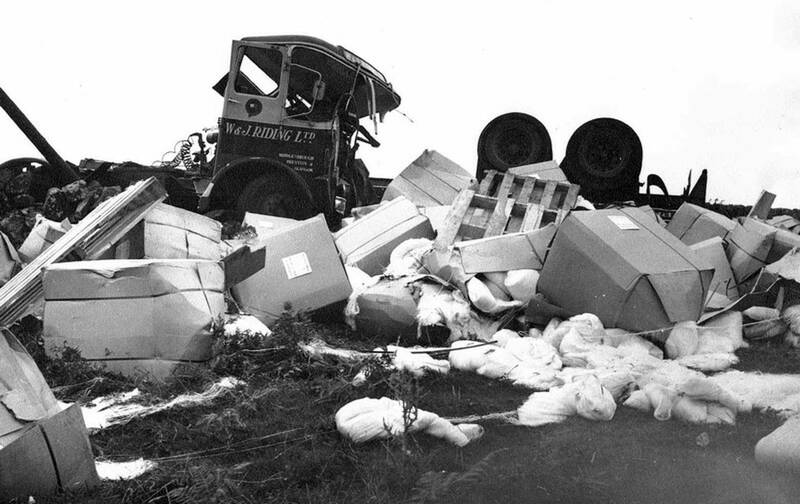 As a result of the accident YWG 496K was a total write off and the remains were broken up and scrapped. In the late 1970's Atkinson Mk II 4x2 tractor unit Reg No ATC 400J Fleet No 74 'Dependable' came to grief on the A75 near Glen Luce in Scotland. Driven by Jim Taylor he had collected the fully loaded trailer from Cairn Ryan on Riding's Kilroot inter factory service with Wilton. Unfortunately while negotiating the bend he was presumably applying a little too much speed which caused the whole outfit to lose it's footing not far into his journey back to Longridge. 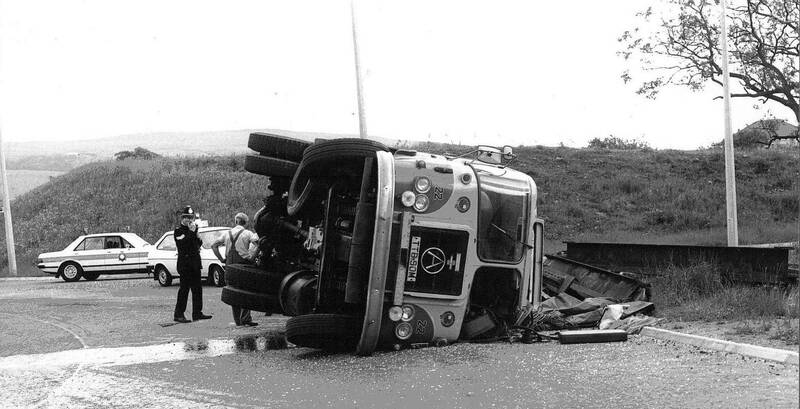 Atkinson Mk II 4x2 tractor unit Reg No ATC 400J Fleet No 74 'Dependable' lays on its side after coming to grief on a bend on the A75 at Glen Luce in Scotland. Another shot of Atkinson Mk II 4x2 tractor unit Reg No ATC 400J Fleet No 74 'Dependable' laid on it's side on the A75 near Glen Luce awaiting recovery. With the A75 closed in both directions during recovery operations Atkinson Mk II 4x2 tractor unit Reg No ATC 400J Fleet No 74 'Dependable', along with it's trailer, are seen here after been righted back on to their wheels. 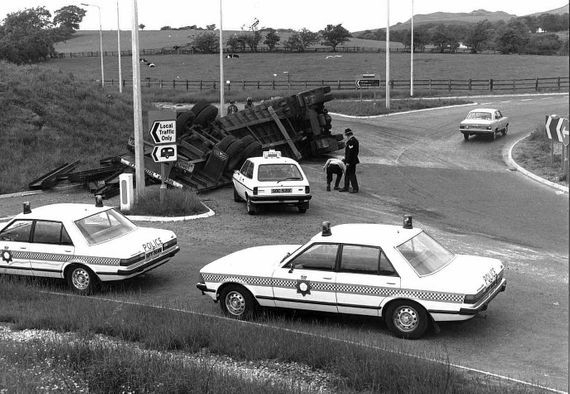 Atkinson Borderer tractor unit Reg No TTB 90M hauling a tandem axle forty foot trailer carrying a full load of steel H section girders came to grief while negotiating the roundabout at the eastern end of the A59 Skipton by-pass. Fortunately no one was hurt in the accident but it did cause some major traffic disruption during the recovery operations which took place later in the day. Cummins powered Atkinson Borderer 4x2 tractor unit Reg No TTB 90M Fleet No 22 is pictured here laying on its side awaiting recovery after overturning at the eastern end of the A59 Skipton by-pass. This great period shot shows the North Yorkshire police out in force as they in attended the roll over accident involving Atkinson Borderer 4x2 tractor unit Reg No TTB 90M Fleet No 22 on the A59 Skipton by-pass. Atkinson Borderer Reg No TTB 90M Fleet No 22 which was involved in the accident at Skipton, was registered new on the 1st of February 1974. It was one of a batch of seven Cummins powered Atkinson's that Riding's bought due to Gardner not being able to supply enough eight cylinder engines at the time. Each one had a Cummins 250 engine in line with a Fuller gear box and Kirkstall hub reduction axle. In June 1974 Frank O'Conner was driving Atkinson Mk II 4x2 tractor unit Reg No UTF 460H when the steel coil it was carrying broke loose at Keadby Bridge near Scunthorpe and finished up on the adjacent railway line. 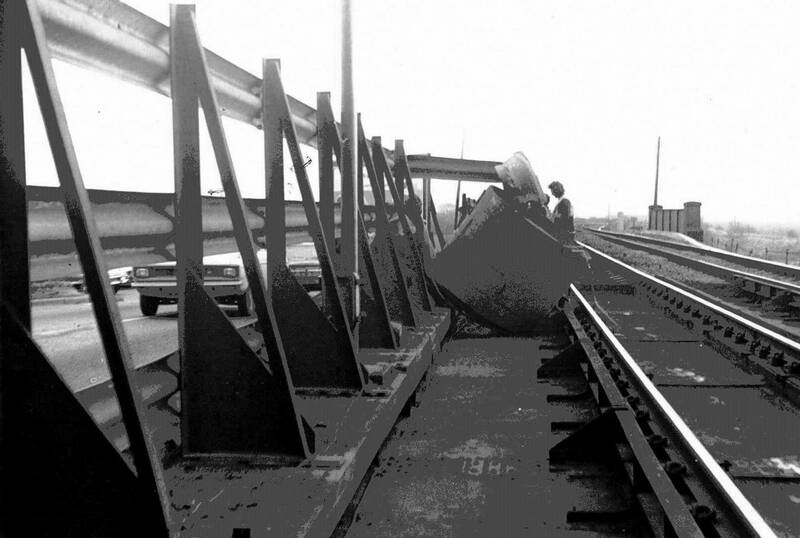 Before Riding's had a fleet of new coil carriers they made some metal frames which sat on a platform trailer to hold the steel coils in place. However on this occasion, unbeknown to the driver, a chain link holding the frame had been crushed. When negotiating the right hand bend at Keadby Bridge, along side the railway, one of the two chains holding the frame broke and the 15 ton steel coil was flung onto the railway line. Fortunately no one was hurt in the incident. Atkinson Mk II 4x2 tractor unit Reg No UTF 460H Fleet No 71 is seen here parked on the A18 at Keadby Bridge with police in attendance shortly after the incident. Driven by Frank O'Conner UTF 460H had been registered new to Riding's five years earlier on the 1st of December 1969 at a cost of £4,287.5p plus vat. 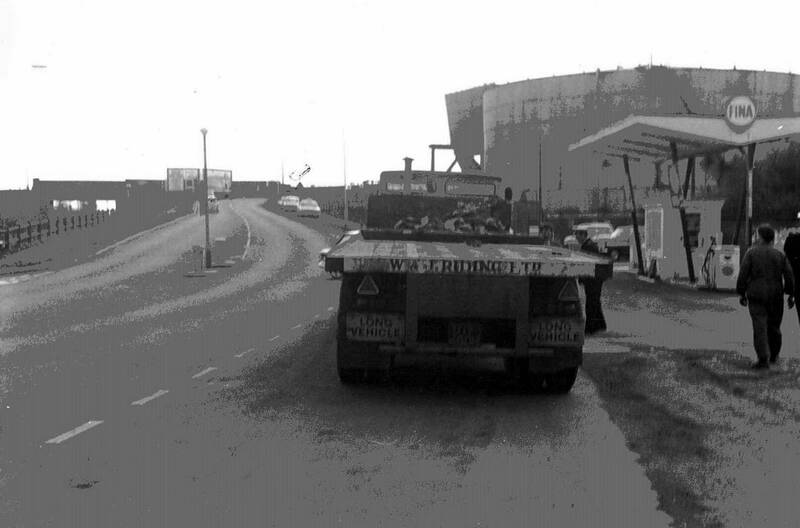 A rear end shot shows the outfit parked up at the side of the road with police in attendance at Keadby Bridge after the steel coil had broken loose. The FINA fuel station on the right has long since gone and is now a car wash facility. The 15 ton steel coil which broke loose is seen here after coming to rest on the adjacent railway line at Keadby Bridge. 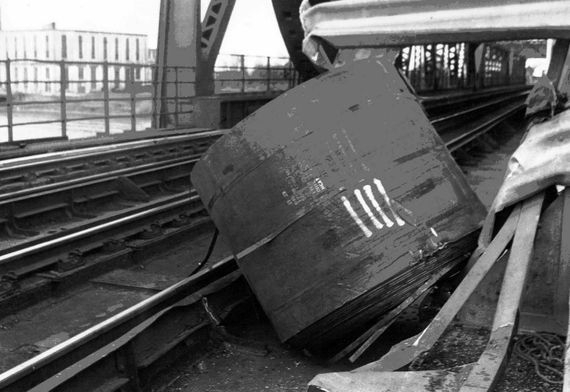 Another shot showing the 15 ton steel coil which landed on the adjacent railway line. The main road and railway line run parallel with each other at this point as they share the same bridge which crosses over the River Trent. 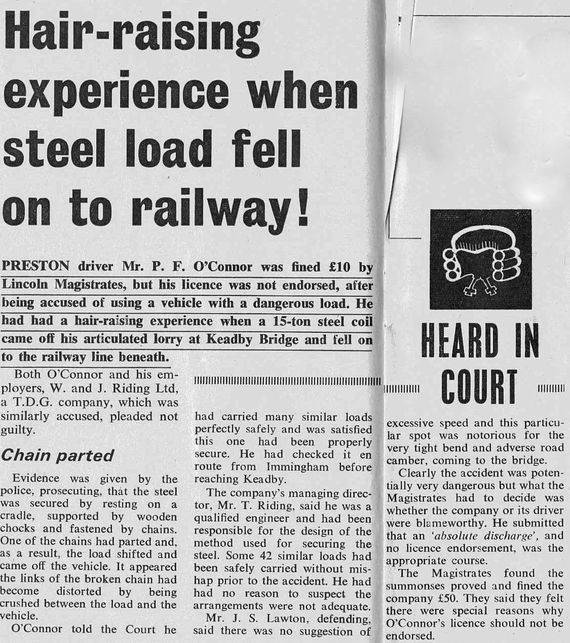 News article from 1974 showing the resulting prosecution after the accident. Driver Frank O'Conner was fined £10 while the company were fined £50. Seddon Atkinson 401 Series 4x2 tractor unit Reg No C50 OBV Fleet No 72 'Vulcan' was powered by a Gardner 6LYT 16 litre 320 engine. Registered new on the 1st of June 1986 at a cost of £27,468 plus vat it was driven from new by Alan Bretherton. 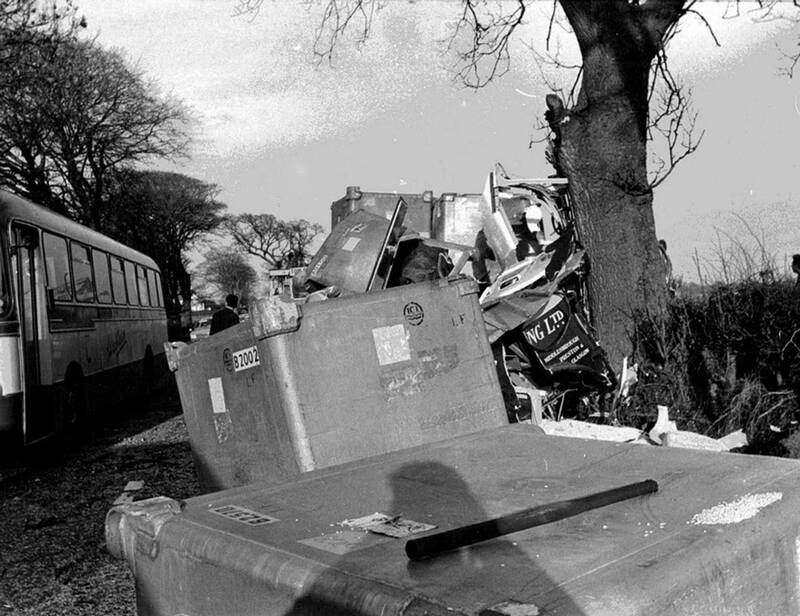 The picture above shows it at Longridge after being recovered following an accident coming out of Edinburgh when it went off the road into a ditch. 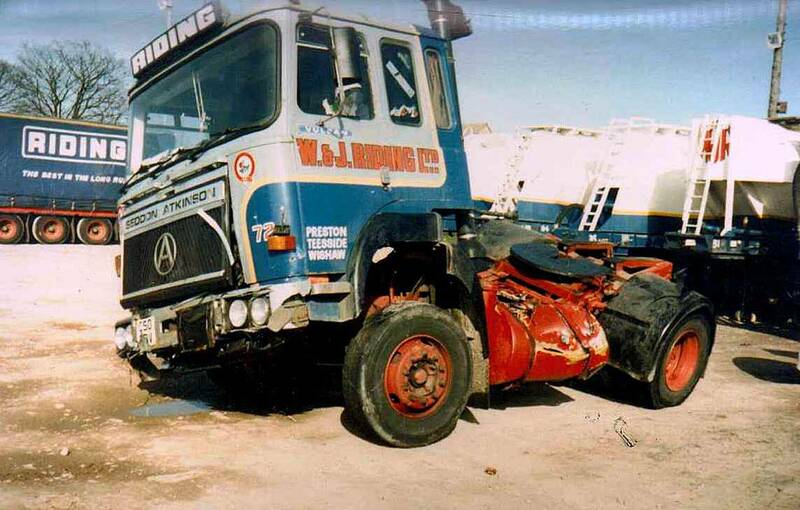 The damage included a badly bent chassis resulting in the vehicle being totally written off and scrapped. Fortunately the Gardner 6LYT 320 engine was saved and later transferred into Seddon Atkinson 401 Series tractor unit Reg No D400 SRN.